The Sport 15 was an important turning point in the history of Moto Guzzi design thanks to the introduction of the saddle tank mounted astride the tubular elements of the frame. This innovation, which originated in England, can be seen as the definitive line of demarcation dividing the products of the pioneering days from those of the early modern age. The other major innovation introduced with the Sport 15 was the substitution of the tubular conrod with an I-section component with the big-end running on needle bearings. Simple and robust, the Sport 15 was a real favourite with many motorcyclists, to the extent that this Moto Guzzi became the best selling bike of the pre-war era. In the early Fifties the Falcone was the most sought-after of the big Moto Guzzis. Powerful and not that simple to ride, it was the sportster parexellence. 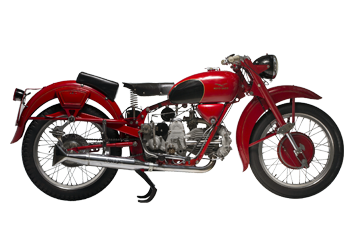 In 1953 the Falcone was produced in a Sport and Turismo version and remained the only half-litre machine in Moto Guzzi’s civilian catalogue. It remained in production until 1967. Special versions were produced for the Guardia di Finanza and other Italian army regiment, the Corazzieri. front, ribbed 3,25x19" - rear, studded 3,50x19"
The most famous racing bike of all time is the Moto Guzzi 8 cylinder GP 500 (1955-57), with a displacement that has never been attempted since. 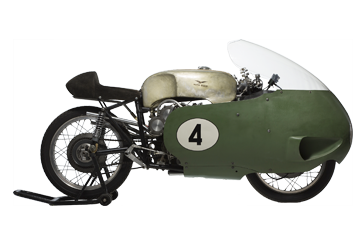 The design engineer, Carcano, began work on the new Guzzi GP racer in 1954, developing an 8-cylinder 4-stroke V90 engine with 498.5 cc displacement. The modernity of the project, which featured highly innovative technical solutions, found itself up against materials that were not as advanced. The initial version of the engine delivered 80 hp at 12,000 rpm, which rose to 72 (at the same revs) in the 1957 version, for a top speed of 280 km/h. The initial version envisaged 6 gears; the remarkable elasticity of the engine, however, allowed use of a 4- or 5-gear shift (depending on the circuit).The solution adopted for the twin-cradle upper single beam frame was interesting. This allowed for oil and coolant to be contained in the upper beam, thus freeing up valuable space around the powerful engine. The fairing was a “bell” type, as was permitted by international regulations at the time. 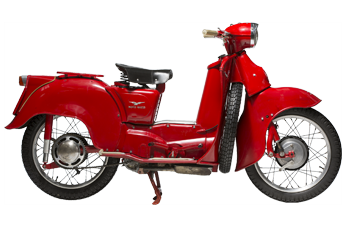 front 2,75x19" - rear 3,00x20"
A combination scooter and motorcycle, the Galletto was hatched by Moto Guzzi in 1950 as a comfortable utilitarian vehicle suitable for female as well as male riders. The initial 150 cc motor soon grew to 160 cc and 175 cc. The definitive 192 cc edition was introduced in 1954. 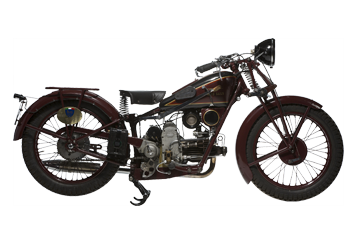 In addition to its simple, highly reliable four-stroke engine, the Cockerel’s defining attribute was a spare wheel bolted to front end of the fairing.